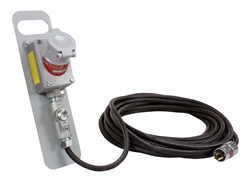 Longtime leading supplier of explosion proof lighting equipment Larson Electronics has announced the release of a heavy duty extension cord equipped with a twist lock explosion proof receptacle and a twist lock general use plug to extend the reach of equipment inside hazardous locations. is designed to extend the reach of equipment in hazardous locations where power receptacles are not in close proximity to the work space. This explosion proof cord is twenty-five feet in length, providing ample length for moving about the work space. This cord is fitted with a single explosion proof 30 amp twist lock receptacle constructed of non-sparking aluminum on one end for connection of equipment and a general area use twist lock plug on the other end for safe and secure connection to power receptacles. This cord, and its plug and receptacles are a 3 pole 2 wire design which works with most common explosion proof equipment. The cord is oil, chemical and abrasion resistant for durability and the receptacles feature deep recessed contacts for protection against arcing and a powder coat finish for resistance to corrosion. This explosion proof extension cord is Class 1 Division 1 Groups C, D and Class 2 Division 1 Groups E, F, and G rated, making it ideal for use in hazardous locations where flammable gases and vapors are present. This cord is perfect for connecting explosion proof lighting, fans and blowers, and extending the range of portable power supplies and substations within the hazardous work area. Larson Electronics produces a full range of industrial and commercial lighting equipment, explosion proof extension cords, explosion proof plugs and receptacles, light towers, and LED work lights. To view the entire Larson Electronics line of industrial grade lighting solutions, visit them on the web at Larsonelectronics.com. You can also call 1-800-369-6671 to learn more about all of Larson Electronics’ lighting products or call 1-214-616-6180 for international inquiries.